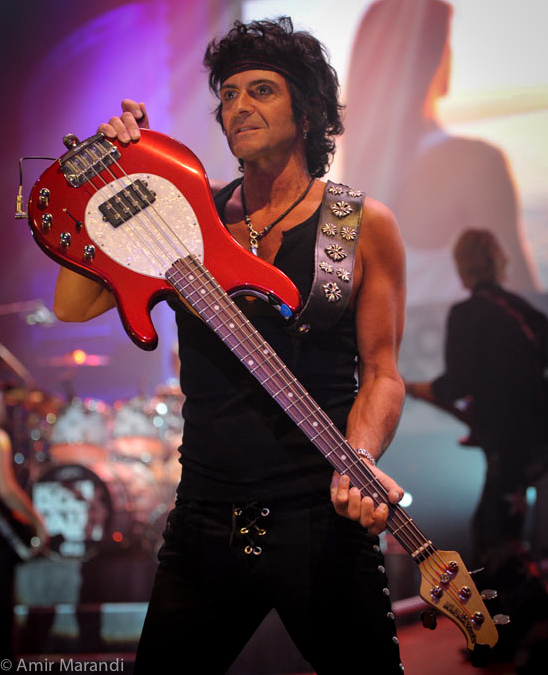 My bass guitar endorsement is with Ernie Ball Musicman Guitars – Four string Sterling basses, four and five string Stingray basses and five string Bongo basses. Thanks to Sterling Ball, Brian Ball, Beth Wreden and Derek Brooks . 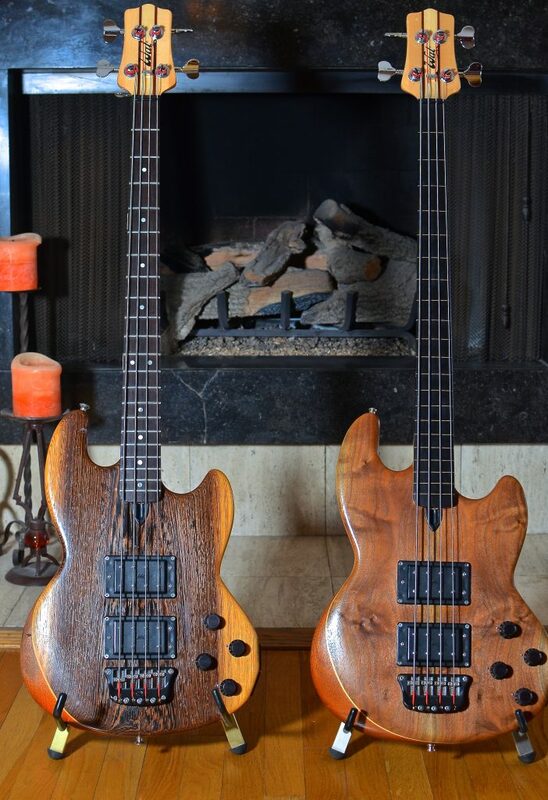 Spector Guitars – My trusty old workhorses; a combination of various NS-2 basses as well as fretless and 5-string models. Thanks to the inimitable Stuart Spector. 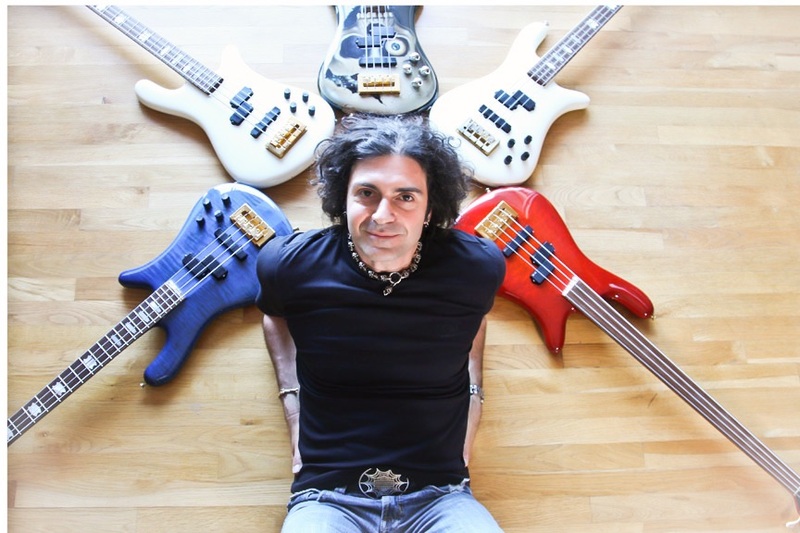 Fernandes Guitars – four, five, piccolo and eight string basses. I also have an assortment of others including this custom Roger Giffin that was used on the Ozzy “Ultimate Sin” tour and the “Shot in the Dark” video. 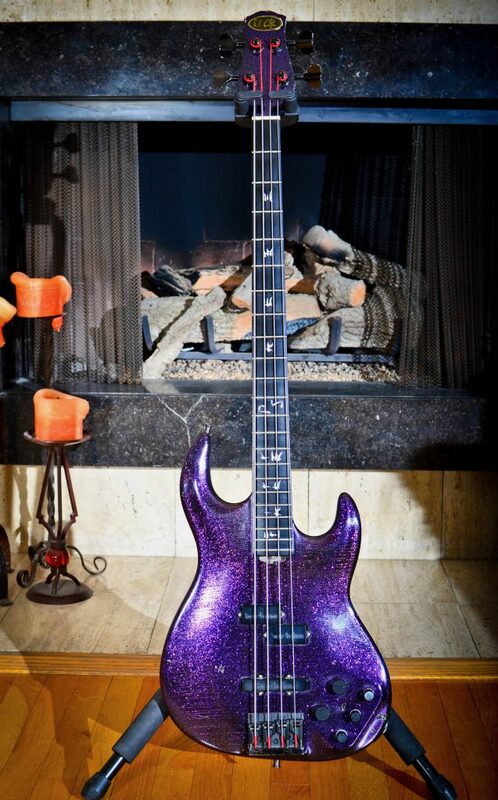 I also use Wal fretted and fretless, Steinberger, Chapman Stick and Gibson EB0 models. Electrics – I mainly use my beautiful Gretsch 1959 6120 TLV – which is an orange 1959 Chet Atkins reissue (thanks to Tony Franklin at Fender) and a Telecaster with Samarium pickups, a Fender Custom Shop 1969 Stratocaster, Gibson R9 custom shop 1959 reissue Les Pauls, a Music Man “Bone” guitar?? (go figure!) and a 1986 BC Rich ASM given to me by Bernie Rico Sr. (RIP). Acoustics – I use a Gibson J200 and a Martin D42 (Frampton model) along with other acoustics and for slide a 1939 Dobro resonator guitar. 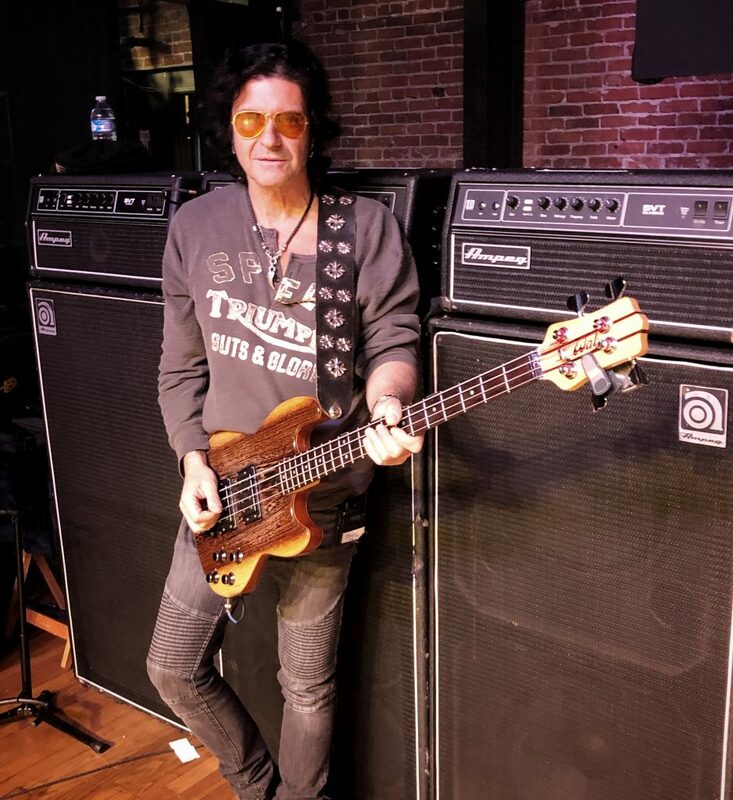 For bass I am endorsed by AMPEG using the Classic SVT series as well as my vintage units – Ampeg SVT2 and SVT3 amp heads with a combination of Ampeg 8×10, 4×10 and 1510 cabs. Many thanks to Dino Monoxelos. I am officially a ROTOSOUND artist. Having used their strings from my first days of bass playing I have now ended up coming back home ! I am proud to be playing the greatest bass strings of all time – the 66 Swing Bass series. While fashions come and go, only LEGENDS remain! Thanks to Jason How. I use the excellent EBS Billy Sheehan pedal (kindly given to me by Billy) for my tone shaping live. Thanks Ralf Bjurbo. I use Lectrosonics unbelieveable quality LT/LR wireless system for my live basses and guitars and their DUET system for my IEM system. Thanks to Kelly Fair and Karl Winkler. I am endorsed by T-REX Effect Pedals. I mainly use the Karma booster, the fantastic Octavius pedal and the Squeezer tube compressor pedal, thanks to Michael Pagaard. I am endorsed by and use Westone ES60 and ES50 in ear monitors. The ES50 has a subwoofer for extended low end, great for bass and the ES60 is flat and great for vocal/guitar performances. Thanks to Michelle Dailey. I am endorsed by NADY Systems for guitar amplifiers and their terrific Ribbon microphones – thanks to Mike Perez, always. 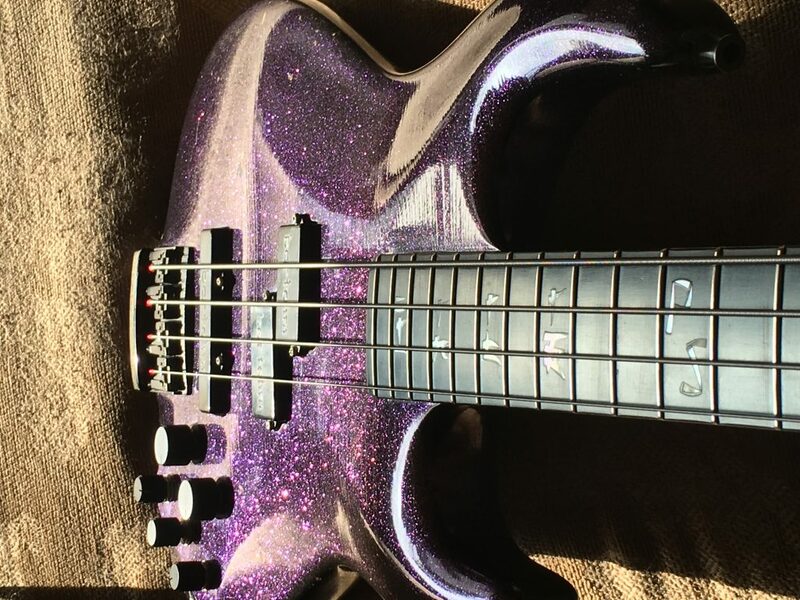 Sometimes I will use a Sobbat DB-Bass overdriver – totally unique, and Boss Bass Chorus pedal. Sometimes I use a Phaser. I also love the Blackstone Appliances overdrive for guitar. Generally I try to keep it simple and down to two effects -VOLUME and ATTITUDE !!! I am endorsed by Jim Dunlop for my accessories and custom made picks – I use the Delrin .96mm. Thanks to Julie Forristall. For recording I use mainly Digidesign Pro Tools. I have been using this since the late 90’s and I actually trained with the folks up at Digidesign’s headquarters. Of course in studios I will use whatever is available in mics, consoles and outboard but invariably I will end up going into my Pro Tools rig where the project stays until it is mastered. My main rig consists of an HD3 accel core and 16 i/o. I use an abundance of plug ins from various different manufacturers. I was also endorsed by and use the now defunct Tascam Gigastudio 3.0 system extensively for the ultimate in sampling requirements.